Pioneer India, the renowned Japanese manufacturer of car infotainment has launched TS – WX70DA Compact Powered Subwoofer with deep and dynamic bass sound quality for the music lovers. The subwoofer comes equipped with some amazing features such as digital base control, back loaded horn structure, installation flexibility, and CLASS-D amplifier. The digital bass control offers two unique base modes to the user – Deep and Dynamic. Deep mode offers rich and deep bass sound quality, and is suitable for genres such as classical, jazz and country. Whereas, the Dynamic mode offers strong and high bass sound quality, and is ideal for genres like EDM, Hip-Hop, and Rock. Back loaded horn structure is designed uniquely to reduce the mechanical resistance while reproducing a natural and deep bass sound to enhance the in-car music experience. Besides, the body is exclusively built in a way that enables users to easily install it, even in the luggage area for optimal utilisation of space. Also, the CLASS-D technology allows users to play the woofer with no direct connection to the car battery, ensuring low power consumption. The Pioneer strive to be at the forefront of innovation in our offerings. The latest subwoofer, TS – WX70DA is a reflection of the same. 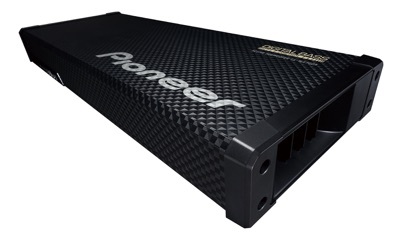 Pioneer continue to introduce more such products in the future and endeavour to scale new heights.